You are welcome to present with your own computer, but we will also provide some laptops with Windows 10. Please test you presentation in the room where you will present well before your session. Presenters of Papers will have a 15-minute slot (plus 3-4 minutes for questions). Paper presentations will be in room EL5. Presenters of Notes will have a 10-minute slot (plus 3-4 minutes for questions). 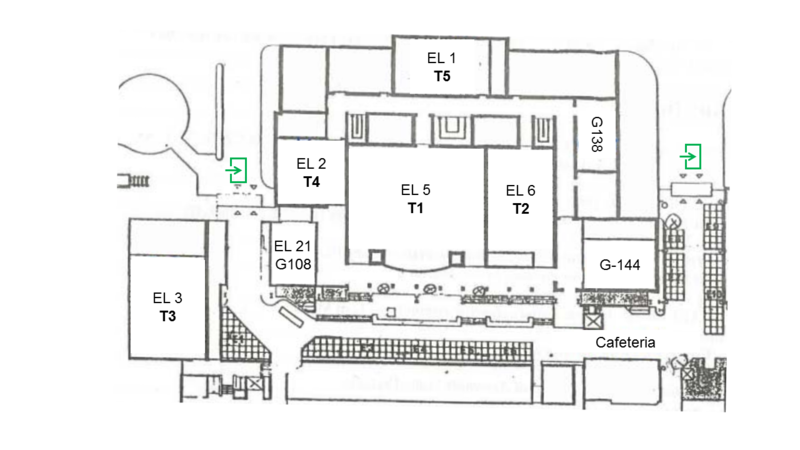 Notes presentations will be in room EL5, EL6 and EL 21, depending your session. Late breaking / Work in progress papers will have 1.5 minutes elevator pitch and will also be presented in exhibition/poster session (15:30-16:30 on Wednesday 20). Elevator pitches will be in room EL5 and exhibition/poster session outside EL5. Late breaking / Work in progress presenters need to bring an A0 poster. Demo & Art papers will have 3 minutes elevator pitch and will also be presented in exhibition/poster session (15:30-16:30 on Wednesday 20). Elevator pitches will be in room EL5 and exhibition/poster session outside EL5. Research and Design papers will have 10-minute slot. Research and Design paper presentations will be in room EL5. The session chair will time you, and show signs with 5, 1 and 0 minutes. An interactive map of Electro Building is HERE and a static one is HERE.